Disclaimer: The information on this page is intended for individuals who have been medically diagnosed with bursitis. If you suspect that you have bursitis then it is important to visit a qualified medical professional in order to rule out any other possible causes prior to considering any advice or treatment option. If you are currently suffering from inflammation, swelling or other painful symptoms caused by bursitis, then it is highly likely that this is starting to affect your work, sleep and lifestyle. Furthermore, if you are someone who enjoyed physical activities or just getting out and about prior to developing bursitis, then it can be quite mentally challenging to deal with. Bursitis can often make even everyday activities difficult, dramatically impacting your quality of life. This resulting change in lifestyle, combined with the ongoing pain and disrupted sleep, may possibly lead to depression in some individuals. Hence it is important to make sure that you properly address bursitis as early as possible. Together with proper rest the OSMO Patch is the ideal way to naturally relieve the inflammation, swelling and associated pain caused by bursitis. 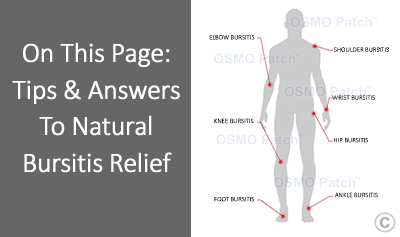 So if your suffering from bursitis and nothing else seems to have worked, or you just want to discover a natural treatment option, then the OSMO Patch may be the ANSWER!. We shall begin with providing ESSENTIAL TIPS to relieve bursitis, then discuss the CURRENT TREATMENTS available and finally learn how the OSMO Patch combined with proper rest now offers an intelligent NATURAL ALTERNATIVE to reducing swelling and associated pain caused by bursitis. 1. Are There any Exercise For Bursitis that you Should or Shouldn’t be Doing? Often when we talk to individuals with bursitis they are either continuing physical activates that may have initially contributed to the condition or they have began an exercise regimen to strengthen the area in the hope of relieving their bursitis symptoms. Unfortunately, exercises for bursitis or other such physical activates only places more stress on the injury, resulting in further aggravating the condition. While it is important to move around normally and not to be bedridden, you should listen to your body and ease off from any activity that is causing pain or placing stress on the affected joint. In particular you should avoid any type of repetitive stress where possible. Even seemingly light repetitive movements if done continually over a period of time will cause irritation. Unfortunately, ongoing irritation may lead to chronic bursitis and subsequent formation of fibrous scar tissue, further resulting in additional inflammation. So if you enjoy exercise, sports or participating in any physical activity we suggest that you take a break from these activities. Remember that a little sacrifice up front can give a great reward in the end. Now while exercise for bursitis is not recommended whilst the condition is active, it may be useful once the condition has completely resolved to rebuild lost muscle mass and strength. This should be done gradually and in some cases it may be helpful to obtain guidance from a qualified physiotherapist to ensure you are doing this correctly. 2. Is Massage a Good Natural Treatment for Bursitis? Many people that we talk to will have already tried deep tissue massage to treat their bursitis. Unfortunately, this is one of the worse things that you can do as it will cause further irritation of the condition. Unlike a muscular injury, which can respond well to massage, bursitis contains inflammatory fluids which are encapsulated in the inflamed and swollen synovial lining of the bursa. The problem with massage is that the fluid can not be dispersed since it is encapsulated. Furthermore massaging directly over the bursitis will only further irritate the already inflamed synovial lining. Massaging can however be extremely good for relieving areas where there is refereed pain. Often people with bursitis may experience pain in different muscles near where the bursitis is. 3. Should you be Applying Ice or Heat for your Bursitis Pain? There is so much misinformation out there regarding treating bursitis. Some people and websites suggest using ice for relieving bursitis pain, while others suggest heat. So what is the answer? When to use ice for treating bursitis? When to use heat for treating bursitis? 4. Are you sure that you actually have Bursitis? What are the Symptoms of Bursitis. What are the Current Treatment Options available for Bursitis? Bursitis is classified as a soft tissue injury and hence should initially be treated with rest and ice within the first 24-48 hrs after the initial onset. The purpose of this is to decrease the amount of inflammation and swelling initially following an injury. Unfortunately in many situations this type of injury will not resolve completely on its own with just rest and icing alone. Instead, bursitis will often continue to remain inflamed and can even become worse over time leading to increased pain and discomfort. It is usually when this occurs that most individuals will then seek medical intervention and first learn that they actually have bursitis after visiting their doctor. Bursitis treatment unfortunately has undergone very little advancement over the past decade or so and most doctors will therefore offer very few alternatives when it comes to recommending a treatment. In general, most doctors will recommend either; anti-inflammatory medication, steroid injections, or painful draining of excess fluid out of the inflamed bursa sac using a syringe. In extreme cases surgery may possibly be recommended. They may already have tried one or more of these existing treatments and experienced little to no benefit. Some individuals will not be suitable for these existing types of treatments due to their age or possibly a pre-existing medical condition. Such procedures can be painful and seen as invasive and perhaps viewed as un-necessary. Finally, many individuals would prefer to exercise their right of choice and firstly choose to try a natural bursitis remedy when dealing with their health. 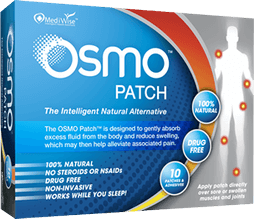 The OSMO Patch is the ideal natural alternative for relieving inflammation, swelling and associated pain from bursitis. Used in combination with proper rest the OSMO Patch now provides a natural alternative way to support the relief of inflammation and pain associated with bursitis. Offers an Intelligent Natural Alternative! So if your ready for a natural approach to reducing, swelling, inflammation & associated pain due to knee bursitis and once again regaining your quality of life… Then the OSMO Patch is the Answer!